The Heart is a hollow muscular organ situated in the mediastinum of the thoracic cavity, enclosed in the pericardium. It’s somewhat pyramidal in shape and placed obliquely behind the sternum and adjoining parts of costal cartilages so that 1/3rd of the heart is to the right of median plane and 2/3rd of the heart is to the left of the median plane. 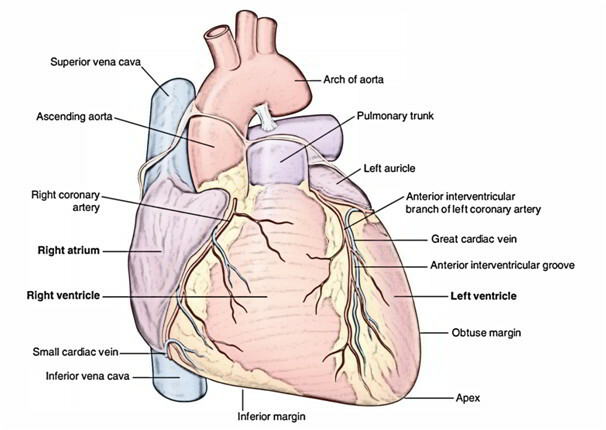 The heart is composed of 4 chambers – right atrium and right ventricle, and left atrium and left ventricle. On the surface the atria are divided from the ventricles by the atrioventricular groove (also named coronary sulcus) and ventricles from every other by interventricular grooves. Weight = 300 g in males; 250 g in females. The heart is somewhat larger than one’s own clenched fist. C. 3 surfaces (sternocostal, diaphragmatic, and left). D. 4 borders (right, left, upper, and inferior). The apex of the heart is a conical area created by left ventricle. It’s directed downwards and forwards, and to the left. It is located at the level of the 5th left intercostal space, 3.5 inches (9 cm) from the midline and just medial to the midclavicular line. It’s the outermost and lowermost thrust of the cardiac contraction (during ventricular systole) felt on the very front of the chest or it’s the Point of Maximum Cardiac Impulse (PMCI). Normally the apex beat is felt as a light tap in left 5th intercostal space in the midclavicular line. 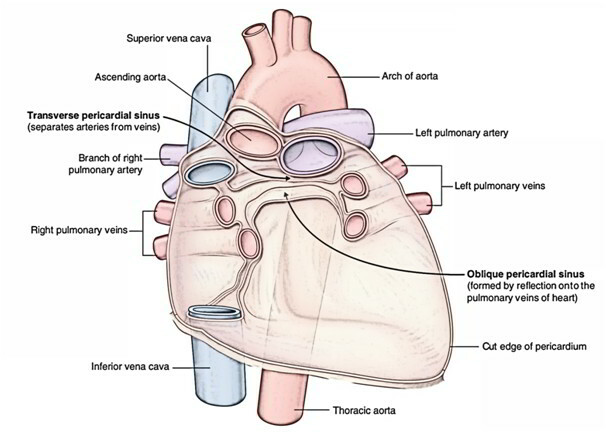 In infants, the heart is positioned more horizontally so the apex of the heart is located in third or fourth left intercostal space and consequently the apex beat in children up to 7 years of age is felt in the third or fourth intercostal space just lateral to the midclavicular line. Normally, the apex of the heart is on the left side and apex beat is felt on the left side (left 5th intercostal space) but sometimes the heart is malpositioned with apex on the right side. This condition is named dextrocardia. It might be related to complete reversal of thoracic and abdominal viscera, a condition named situsinversus. The base (or posterior surface) of the heart is composed by 2 atria, primarily by the left atrium. Strictly speaking 2/3rd of the base is composed by the posterior surface of the left atrium and 1 -third by the posterior surface of the right atrium. It’s directed backwards and to the right (i.e., opposite to the apex). A. It is located opposite to the apex. B. It is located in front of the middle 4 thoracic vertebrae (i.e, T5-T8) in the lying -down position and descends 1 vertebra in the erect posture (T6-T9). C. The base is divided from vertebral column by the oblique pericardial sinus, esophagus, and aorta. Medically, base is the upper border of the heart where great blood vessels (superior vena cava, ascending aorta, and pulmonary trunk) are connected. It is created primarily by the right atrium and right ventricle, that are divided from every other by the anterior part of atrioventricular groove. The sternocostal surface is also partly created by the left auricle and left ventricle. The right ventricle is divided from left ventricle by the anterior interventricular groove. The left atrium is hidden on the front by the ascending aorta and pulmonary trunk. The part of sternocostal surface is uncovered by the left lung (cardiac notch) creating an area of superficial cardiac dullness. This surface is flat and rests on the central tendon of the diaphragm. It’s created by the right and left ventricles that are divided from every other by the posterior interventricular groove. The left ventricles create left 2/3rd of this surface and right ventricle creates only right 1/3rd of this surface. It’s created primarily by the left ventricle and partly by the left atrium and auricle. It’s directed upwards, backwards, and to the left. The two superior chambers are the atria (a^tre-ah) (singular, atrium), which receive blood being returned to the heart by the veins. The two inferior chambers are the ventricles (veni-tri-kuls), which pump blood into the arteries. There is no opening between the two atria or between the two ventricles. The atria are separated from each other by a partition called the interatrial septum. The ventricles are separated by the interventricular septum, a thick partition of cardiac muscle tissue. The heart is a double pump. The right atrium and right ventricle compose the right pump. The left atrium and left ventricle compose the left pump. The walls of the atria are much thinner than the walls of the ventricles. Differences in thickness are due to differences in the amount of cardiac muscle tissue that is present, which in turn reflects the work required of each chamber. Atrial walls possess less cardiac muscle tissue because blood movement from atria to ventricles is mostly passive, so that force from contraction is not as essential. The ventricles have more cardiac muscle tissue in order to create enough force to push blood superiorly out of the heart. The left ventricle has a thicker, more muscular wall than the right ventricle because it must pump blood throughout the entire body, except the lungs, whereas the right ventricle pumps blood only to the lungs. It’s more or less vertical and is composed by the right atrium. It extends from the right side of the opening of SVC to that of IVC and separates the base from the sternocostal surface. It’s curved and oblique. It’s created primarily by the left ventricle and partly by the left auricle. It extends from left auricle to the apex of the heart and separates sternocostal and left surfaces. It is almost horizontal and extends from the opening of IVC to the apex of the heart. It is created by the right ventricle. The right atrium also creates a part of the border. The inferior border separates the sternocostal surface from the diaphragmatic surface. Near the apex it presents a notch termed incisura apiciscordis. It is somewhat oblique and is composed by the left and right atria, primarily by the latter. The upper border is obscured from the view on the sternocostal surface because ascending aorta and pulmonary trunk is located in front of it. On the surface of the body it can be marked by a line joining a point on the lower border of the 2nd left costal cartilage, 1.5 in from the median plane to a point on the upper border of 3rd right costal cartilage, 1 inch far from the median plane. 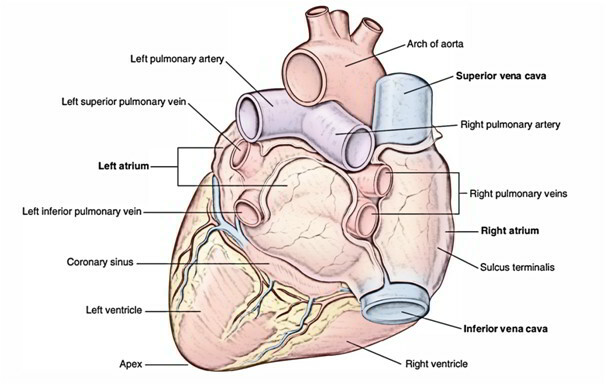 Like all pumps, the heart contains valves that allow the blood to flow in only one direction through the heart. The two types of heart valves are atrioventricular valves (AV valves) and semilunar valves. Blood is oxygenated as it flows through the lungs and becomes deoxygenated as it releases oxygen to body tissues. The right atrium receives deoxygenated blood from all parts of the body except the lungs via three veins: the superior and inferior venae cavae and the coronary sinus. The superior vena cava (ve’-nah ka’-vah) returns blood from the head, neck, shoulders, upper limbs, and thoracic and abdominal walls. The inferior vena cava returns blood from the inferior trunk and lower limbs. The coronary sinus drains deoxygenated blood from cardiac muscle tissue. Simultaneously, the left atrium receives oxygenated blood returning to the heart from the lungs via the pulmonary veins. Blood flows from the left and right atria into the corresponding ventricles. About 70% of the blood flow into the ventricles is passive, and about 30% results from atrial contraction. After blood has flowed from the atria into their respective ventricles, the ventricles contract. The right ventricle pumps deoxygenated blood into the pulmonary trunk. The pulmonary trunk branches to form the left and right pulmonary arteries, which carry blood to the lungs. The left ventricle pumps oxygenated blood into the aorta (a-oL-tah). The aorta branches to form smaller arteries that carry blood to all parts of the body except the lungs. Because the heart is a double pump, there are two basic pathways, or circuits, of blood flow. The pulmonary circuit carries deoxy- genated blood from the right ventricle to the lungs and returns oxygenated blood from the lungs to the left atrium. The systemic circuit carries oxygenated blood from the left ventricle to all parts of the body except the lungs and returns deoxygenated blood to the right atrium. The heart requires a constant supply of blood to nourish its own tissues. Blood is supplied by left and right coronary arteries which branch from the aorta just distal to the aortic valve. Blockage of a coronary artery may result in a heart attack. After passing through capillaries in cardiac muscle tissue, blood is returned via cardiac veins, which lie next to the coronary arteries. These veins empty into the coronary sinus, which drains into the right atrium. Also, study the relationships of the atria, ventricles, and large blood vessels associated with the heart. Cardiac shadow in chest radiograph: In X-ray of chest, PA view, the term cardiac-shadow is utilized for mediastinal shadow. The left border of cardiac shadow, from above downwards is composed by: aortic arch, pulmonary trunk, left auricle and left ventricle. The right border from above downwards is composed by SVC and right atrium.